I work for a bank. We're designing an online application system that allows you to open new bank accounts online and then add one joint account owner to each of your new accounts. The people being added could be in the system already if the user added joint owners previously or they could be new joint owners. I looked at other banking sites and I can't find an elegant way to handle this. Here's an idea I have. The screen shows the names of people who have been added as joint accounts previously with an option to create a new joint account owner. For each name, they can select any of their new accounts. Each account can only have one joint owner, so once a joint owner has been added to an account, no one else can be added unless the joint owner is removed. This needs to work on responsive web so drag-and-drop options are out. A drop down doesn't seem like the best approach because there might be just one or two accounts to add joint owners to. 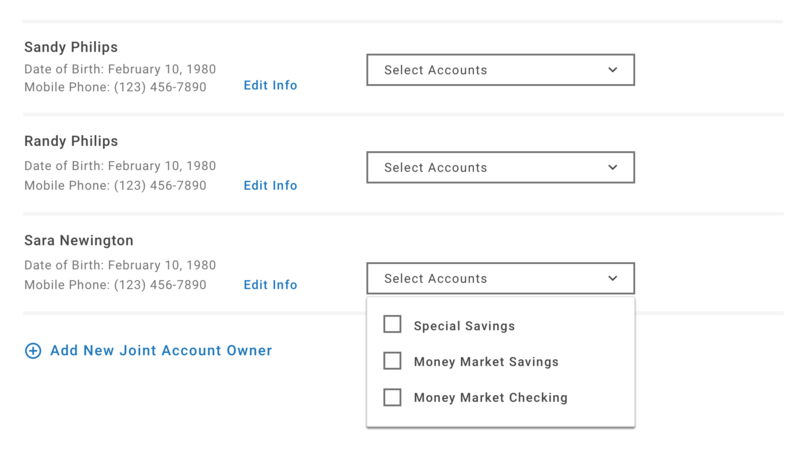 I would turn it around, show an overview of the accounts & then add joint account owners to the account instead of the way around (which is your current solution). The adding of a user to a joint account can be done in a form (full-screen-dialog / modal) after clicking the CTA "Add owner to account". This way you have the full attention of your user for the required action, which is adding the details of a new joint account owner or select joint account owner from a 'known users'-list. Not the answer you're looking for? Browse other questions tagged dropdown selection banking or ask your own question.